*While England’s Royal Family prepares for the upcoming Royal Wedding of HRH Prince William and Kate Middleton, back home in America our very own royalty, Queen of Soul Aretha Franklin, was busy planning her majestic 69th birthday celebration that took place at the posh Helmsley Park Lane Hotel on tony Central Park South Friday, March 25, 2011. I was there and can tell you that the late night shindig was a Royal Flush! Everyone knows that “our” Queen is a stickler for perfection or – off with your head! So her New York based media representative Tracey Jordan and Franklin’s personal assistant Zoretha Coleman pulled out all stops to make sure that every aspect of the gathering was swellegant starting with the swanky place. The Park Room Restaurant is one of NYC’s finest venues boasting plush Central Park as its backdrop and a celestial sky as its ceiling. No need for heads to roll as the room was breathtakingly beautiful and just what the Queen ordered! Franklin, who just a few months ago underwent surgery, arrived on the arm of her handsome long time friend Willie Wilkerson. She looked ethereal in a gorgeous flowing white and gold gown with gold accessories. Special mention to her fabulous gold bag which was never too far from her reach. And when the svelte birthday celebrant entered the room, imaginary trumpets seemed to have gone off in everyone’s head as she was greeted with a dancing ovation to her music. 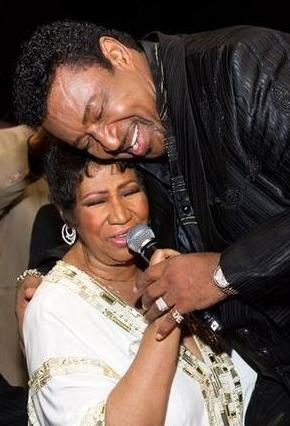 As the Queen would have it, the joint was jumpin’ and even Franklin – who appeared to be full of energy — couldn’t sit down; and once seated found it hard to keep still. She was visibly pleased and enjoying her luxurious birthday gathering. This was a sit down affair and every guest had a seat. The regal seating arrangements included formal dinnerware, larger than life exotic floral arrangements and a long and winding dessert bar. There was never a need to leave your table other than to dance as nattily dressed roaming butlers delivered whatever you desired – including premium libations of your choice — to your table. The royal menu was fit for the Queen and her noble guests dined on Chicken Satay (peanut sauce), Coconut Crusted Shrimp (orange Dijon sauce), Spicy Shrimp Spring Roll (teriyaki dip); Lobster and Tropical Fruit Salad (blue corn tortilla), Smoked Salmon Mousseline (herbed cream cheese pumpernickel) and Smoked Duck Breast (lingoberry preserves, rye toast). There were also two carving stations: Ms. Franklin Baked Ham and Roast Sirloin of Beef. Seen paying homage to the Queen were Bette Midler, Victoria & Michael Imperioli, Star Jones, Smokey Robinson, Roberta Flack, Michael Eric Dyson, Brenda & Dennis Edwards, Eddie Franklin, Frankie Von Franklin, Al Roker, Deborah Roberts, Sue Simmons, Janice Huff, Lu Willard, Stan Hoffman, Dedra Tate, Leslie Burns, Don Thomas, Rev. 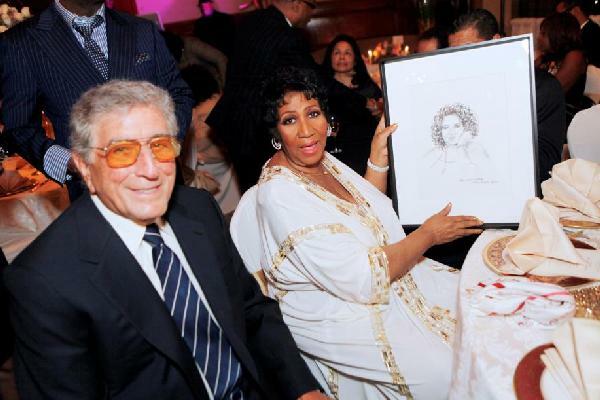 Al Sharpton, Gayle King, Wendy Williams, Gregory Dunmore, Ace West, Kevin Hunter, Clive Davis, Sherri Shepherd, Gwen Quinn, Butch Lewis, Judge Greg Mathis, Cathy Hughes, Zoretha Coleman and Tracey Jordan, and Tony Bennett who presented Franklin with a beautiful sketch.